When the hubby and I were expecting baby #1, we were on cloud nine. I admittedly had that sought after “all belly” look (which comes at a high price of extreme back pain during labor by the way). Nonetheless, I greatly enjoyed being pregnant. Then a year later, here comes baby #2. …there was no all belly figure. There was no glow …except for shine of sweat from hot flashes. It was the opposite of my first pregnancy, BUT there was a brief period during the second trimester where morning sickness leveled out to a minimum and I wasn’t quiiiite nearing the physical pain and discomfort that the third trimester would soon bring. The second trimester is referred to as “the honeymoon phase” for many expecting mothers. For brides planning a wedding, there’s a similar honeymoon phase …not the actual honeymoon, that’s later. The honeymoon phase is the middle of your engagement. You are at the half way point, celebrating at the top of the hill. You’ve tackled all the big items, what a relief, right? …and you don’t have to worry with the tedious tying of loose ends yet because hey, you still have plenty of time. The "first trimester" of the engagement, before the honeymoon phase, can stir up some anxiety and stress. I cannot tell you how many brides admit that creating the guest list is one of THE MAJOR STRESSORS in planning. It's often what holds up the production of stationery ...you know, since the guest list sort of kind of dictates the number of invitations you need... among other things. The Guest List is built from many elements and much of your planning hinges on that final headcount. So you go to get started thinking "I'm going to tackle this and be done", but then you wonder, “what’s the proper way to address these guests anyway?” Who receives what? How do I address Uncle Joseph who is serving in the military? Does your cousin/college student who still lives with her parents need her own invitation (yes, she does)? Take the "measure twice, cut once" approach to building your guest list. .....because if you’re going to spend the time investment collecting all the necessary information from each guest, you may as well do it right and do it once. IS THERE A PROPER WAY TO WRITE MY GUEST’S NAME? If possible, collect the full name (first, middle, last) of your guest(s). Be sure to collect the proper social, professional, or military titles for all guests. HOW DO I INCLUDE A GUEST AND THEIR CHILDREN? Traditionally, a formal invitation is mailed in two envelopes. The inner envelope is reserved for the individual names of the main invitees and additional invitees, such as children or an invitee and a guest. If you are mailing your stationery in a single envelope, you would include the added invitees on the single envelope. All guests who receive a save the date should receive a wedding invitation. It should be considered that engagement party invitees should also receive at least one invitation to a pre-ceremony celebration, such as a couple’s shower or bridal shower. Every guest or person who offers a gift or service in your honor should receive a thank-you note. -Abbreviations are not used, except for Mr., Mrs., Ms.
-Jr. and Sr., along with Doctor and Military titles are preferably spelled out unless the name is particularly long written on a single line. -For the address line, the words Street, Avenue, Boulevard, and Post Office Box are written in full. State names should be written out. -Professional titles are written in full but social titles may be used if preferred. -Educational degree titles are not used in wedding invitations, envelope addressing, or announcements, but replaced with social titles. -People who are customarily addressed by their professional titles may use them on the invitation—Judge, Mayor, etc. -All military titles are written in full on invitations, announcements, and addressed envelopes. The rank is traditionally included under the guest's title. It is acceptable if military personnel would rather use their professional or social titles. If you know the children well, you may indicate their first names only on a single line under their parent’s name on the inner envelope. Otherwise, use the children’s full names written on their own line. Children aged thirteen and over should receive an individual invitation. If that is not possible, you may include them with using same rules as above. If you are using formal courtesy titles, Miss is reserved for teenage girls between the age of 13 and 18, Ms. reserved for 18 and older. Teenage boys receive the title Mr. once they reach 18 years of age. If you know the couple well, you may indicate first names only on a single line for a more casual approach to the inner envelope. If you are using an outer and inner envelope, you would address the outer envelope to your invitee and reserve “Mr. McGee and Guest” for the inner envelope. On the inner envelope, you should treat military and professional titles as you would social titles, written in full, along with the surnames only. If one or both the invitee and spouse or guest serve in the military, the higher ranking title would appear first (regardless of the gender). Track your guests, addresses, rsvp replies, thank you notes, and all kinds of greatness. …or simply leave a comment below and I’ll be your answering guide! 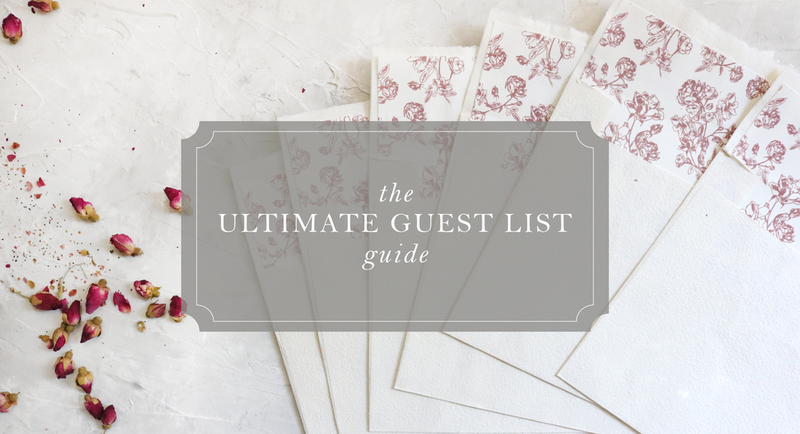 …your Fairy Godmother of envelope & guest list etiquette. Probably equally importantly as the stationery itself, you have your envelope addressing. Without this step, those pretty envelopes will go nowhere. Plan ahead if you wish for your envelopes addressed by hand by a calligrapher. Calligraphers often need several weeks, at least, to complete certain types of calligraphy, but more time is always better. CLOSE FAMILY & FRIENDS. Outer envelopes are always addressed with full names. Inner envelopes are addressed with familiar names and titles for close family members and good friends. MARRIED COUPLES WITH YOUNG CHILDREN. If you know the children personally, you can address the inner envelope with first names only. Otherwise, you would use the children’s full names without titles. You generally would not include the children’s name on the outer envelope. TEENAGERS IN THE HOME. Children aged 13+ should really receive individual invitations. If this isn’t possible, include them in their parents’ invitation with courtesy titles. Teenage girls are “Miss,” but the title “Mr.” is reserved for young men 18 years old and older. COUPLES WHO LIVE TOGETHER. As long as you know that two people at the same address live together as a couple, you can address one invitation to both. MILITARY TITLES. When the bride and/or groom or the parents of the bride or groom are members of the military services or serving active duty, their military titles are used. All military titles are spelled out and not abbreviated on the invitation, mailing addresses, or any other stationery. ABBREVIATIONS. You should not abbreviate "Doctor" as you would on other phrases (Mr., Mrs., Ms.). You can abbreviate Sr. and Jr. if wished. You should spell out any other words, like the state, road, street, etc. WHAT IF I DON'T WANT TO INVITE CHILDREN? If you wish to have an adults only ceremony and reception, you simply would not include the children's names on the inner envelope. WHAT IF I DO WANT TO INVITE CHILDREN? If you wish to invite children to your ceremony and reception, you would include the children's name on the inner envelopes following the etiquette above. Teenage children living in the home should receive their own invitation. DO I INCLUDE THE LAST NAMES FOR CHILDREN? For young children, you do not need to include the last name on the inner envelope. HOW INFORMAL SHOULD THE INNER ENVELOPE BE? Thank you for asking your question! I look forward to answering it for you within the next couple of business days. TO NEW CLASSES, WORKBOOKS, NEWLY RELEASED ARTWORK AND MORE. We promise to respect your privacy.